Black Bear Design is proud to partner with Steel to redesign the site, which reflects the company’s re-focused commitments to their clients. Steel, LLC is inviting users to explore their new website at www.steelincga.com. 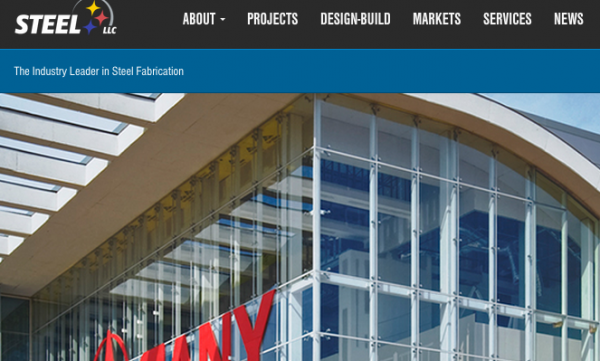 Black Bear Design is proud to partner with Steel to redesign the site, which reflects the company’s re-focused commitments to their clients providing structural steel, miscellaneous metals, ornamental metals, erection, and services to general contractors, owners and developers across the nation. Created with the user experience firmly in mind, the website has been designed using the latest technology so the site is compatible with today’s browsers and mobile devices. The goals of the project were to build a responsive website that had a great user experience across multiple devices, an integrated timeline showing over 70 years of experience in the industry, industries and markets with which the company works, and highlights of projects that have been designed and built. The website includes over 50 comprehensive pages of company information, history, services, markets, news and projects coupled with detailed images and key information about each project. From conventional structures to complex building structures, Steel, LLC devotes countless hours to understanding each project and the challenges each client faces in getting it off the ground. Steel, LLC specializes in suburban mid-rise office buildings, hotels, sports arenas, convention centers, aviation/aerospace structures, and distribution centers, to name a few. The company pays special attention to ensure they have the appropriate resources and works closely with all team members to facilitate communication amongst the contractors and management teams. Steel, LLC was founded in 1947 and is located in Scottdale, Georgia, 20 minutes outside of Atlanta. The company is a leading steel fabricator and boasts the strength, resources, and know-how of a large national steel manufacturer with the detailed project management and responsiveness you would expect from a smaller fabricator. To learn more about Steel, LLC or to obtain a quote, visit www.steelincga.com.